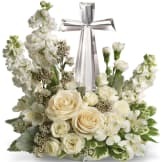 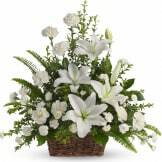 This graceful arrangement, in elegant white and soothing green, is the perfect way to express your feelings of love and sympathy. • This all white bouquet includes roses, alstroemeria, carnations, snapdragons, spider chrysanthemums, and accented with assorted greenery. • All orders from the Sympathy Store are hand-designed and delivered by a local florist. 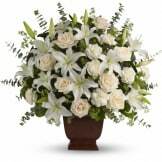 • This arrangement measures approximately 31" W X 35" H.
Flowers will be received by a Needham-Jay Funeral Home Inc.'s staff. 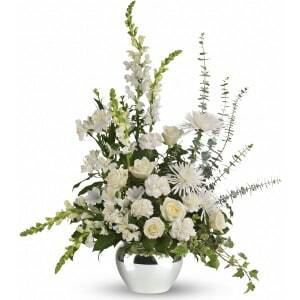 All of our flowers are designed and delivered by hand from a local florist in in Petrolia.